To Make the Marsala Mushrooms: Melt the butter in a small nonstick frying pan over medium heat. Add the garlic and cook, stirring until it gives off its aroma and begins to turn translucent, about 2 minutes. Add the mushrooms, salt and pepper and cook, stirring, until the mushrooms just begin to brown around the edges, 5 to 7 minutes. Stir in the Marsala and continue cooking until all the liquid has been absorbed or evaporated, about 12 minutes more. Transfer to a bowl, let cool slightly, cover with plastic wrap, and refrigerate. thoroughly. Dip the eggplant slices, one at a time, in the egg to coat them thoroughly, then stand them on their edges briefly to drain off the excess. Dredge the eggplant slices in the crumbs to coat thoroughly; set the slices aside on a plate or a sheet of waxed paper, and discard any remaining crumbs. In a large heavy skillet, heat 1/4 cup of the olive oil over high heat just until it begins to give off faint wisps of smoke. Carefully place half of the breaded eggplant slices in the pan and cook, rotating the pan to ensure even cooking, until their undersides are lightly browned, about 2 minutes. Use a fork or tongs to carefully turn the slices over. Sprinkle their tops with 1 tablespoon of the Parmesan cheese and continue cooking until their second sides are lightly browned, about 2 minutes more. Transfer the slices, cheese side down, to a smooth surface, such as a plate or baking sheet. Sprinkle 1 tablespoon more of the Parmesan cheese on top of the cooked slices. Repeat the process with the remaining 1/4 cup olive oil, breaded eggplant slices, and 2 tablespoons Parmesan. Set aside. To make the Marinara Sauce: Combine the olive oil, onion, and garlic in a nonstick saucepan and cook over medium heat until the onion begins to turn translucent, 3 to 5 minutes. Stir in the tomatoes, wine, basil, oregano, salt, and pepper. Bring to a simmer, then reduce the heat to low and cook, stirring occasionally until thick but still fairly fluid, about 20 minutes. Stir in the tomato paste and continue cooking, stirring occasionally, for about 10 minutes more. Remove from the heat and set aside. To Make The Lasagna: Bring a large pot of salted water to a boil and add a small splash of olive oil. Add the lasagna noodles and cook until al dente, 8 to 10 minutes. Preheat the oven to 350F. On the bottom of a 13 x 9 inch baking pan, evenly spread 1 cup of the Marinara sauce. Place a layer of lasagna noodles over the sauce. Evenly cover the pasta with the Marsala mushrooms. Sprinkle 1 cup of the mozzarella cheese over the mushrooms, then evenly spread 1 cup of the marinara sauce over the mozzarella. 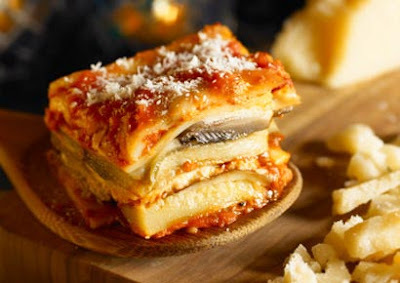 Sprinkle 1/2 cup of the Parmesan over the marinara sauce, and place another layer of the lasagna noodles on top. Arrange the eggplant Parmesan slices evenly on top of the pasta, and sprinkle with the remaining 1 cup mozzarella and 1/4 cup of the Parmesan. Spread the remaining Marinara sauce on top. Bake for 40 minutes. Garnish with the remaining 1/4 cup Parmesan and the parsley, cut into squares, and serve.